When I pronounce it, it scares my cats. Look, maybe I didn’t say every tiny syllable, no. But basically I said them, yeah. One thousand points to Alasseo for using “onomatopoeic” in a sentence. onomatopoeic means that the word sounds like the action it describes. I’m really scared now. that sounds like hell! The only “word” which does not follow this pronounciation is Cthulhu’s name, being as it is his name and has a different phoenetic base. 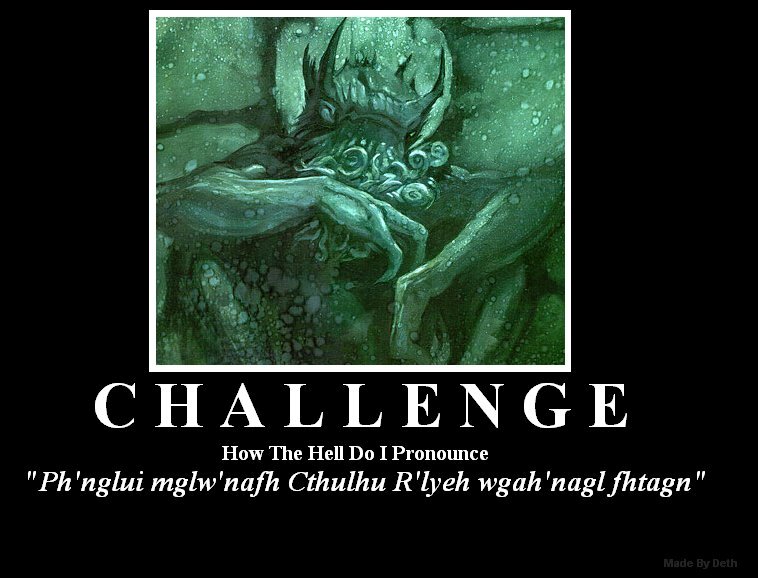 The only similarity is that the h in his name and the language of R’lyeh is pronounced the same. “Ph’nglui mglw’nafh Cthulhu R’lyeh wgah’nagl fhtagn” is generally translated as “In his house, dead Cthulhu of R’lyeh waits dreaming. ” But… what they don’t tell you is that “dreaming’ is an inexact translation for ‘fhtagn. ‘ It also means “creating. ” And ‘wgah’nagl’ doesn’t actually mean “waits. ” It’s more a measurement of time… so a more exact translation would be “from his place of power, inert Cthulhu of R’lyeh temporarily creates. ” You have to admit, the other translation is much more poetic. See what he is dreaming of is us, and through his dreams we are created. So when he begins to dream of something else… of waking perhaps… our world will end. Uh, it’s phonetic, so the idea of Welsh rules just sounds like an attempt to make it more human/pronouncable. I think it’s really guttural, hence the large number of “G”s and “H”s. …if you ask me, I think it’s largely gibberish concocted by H.P. But we can go with trying to pronounce it, too. to write it out phoenetically at least. I could be way off the mark though. See also: Eben Brooks’ (Yes, the guy who did Still Alive) “Hey There Cthulhu,” roughly two-thirds in. Where are you getting all this information? I assume it is all from latter sources, because Lovecraft never specified any pronunciations nor word-for-word translations (besides the overall translation). The words aren’t theoretically supposed to be spoken by humans, but it is the closest humans can come to pronouncing it properly. Eazee when u has tentaclez 4 lipz.